Vol. 3 anniversary book includes box cover! Volume 3 of the 3-volume "Nitro+CHiRAL 10 Years Archive" anniversary book series, chronicling the 10-year history of Nitro+CHiRAL! This third and final installment focuses on the all new artwork and illustrations created for TOGAINU NO CHI: True Blood, DRAMAtical Murder re:code, and other product displays, our "The CHiRAL Night" concert series, April Fools shenanigans, as well as other materials used in promotions and events. A complete collection of all the material not included in volumes 1 and 2. Thorough and unabridged, allowing you to look back at just how far Nitro+CHiRAL has come. In addition, this volume includes a box sleeve for storing all 3 volumes of the "Nitro+CHiRAL 10 years Archive" - a befitting and must-have item for any fan collecting our 10-year history archives! 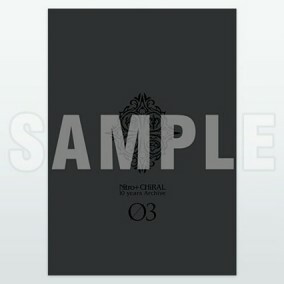 Includes "Exclusive Box Sleeve" for storing all three volumes of "Nitro+CHiRAL 10 years Archive."